Yesterday was Labour Day here in Canada. It is the last day of summer vacation before the kids go back to school. It is supposed to be a fun day to enjoy the last minutes of freedom. Today was not that kind of day. These pictures were not taken today. I woke to my daughter crying. She told me Wizard had fallen. I had trouble processing what she meant but she was crying hard enough that I knew there was trouble so I had to move quickly. I found Wizard on the kitchen counter not breathing and no pulse. The other cats were still with him where they had all been eating breakfast. I gathered more details from my daughter later. She got up and fed the cats. 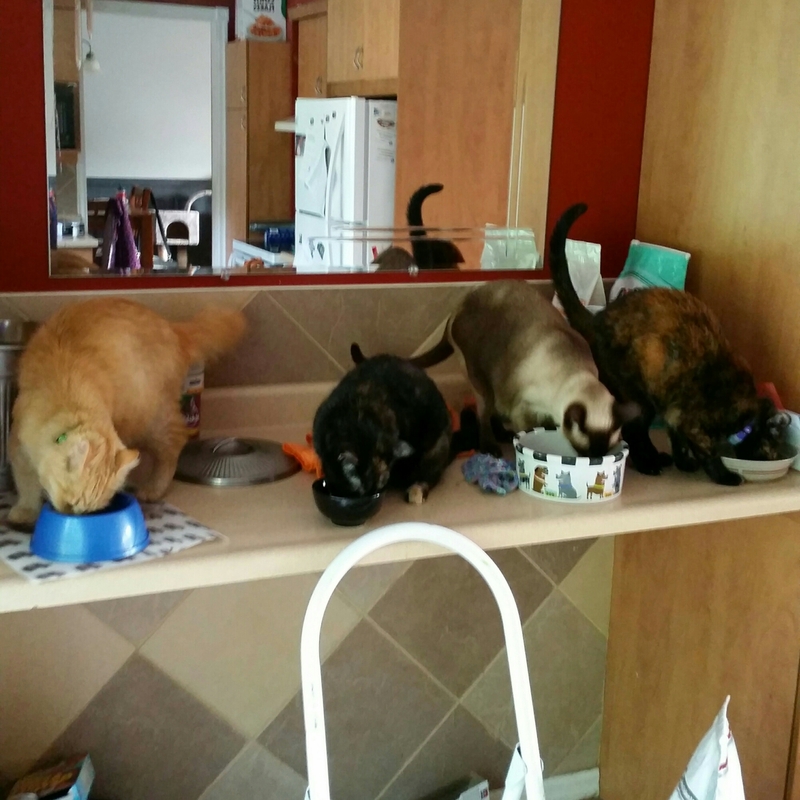 They had all jumped up to the counter by themselves. They were eating when she heard a thump. Wizard had fallen on his side completely limp. He was gone that quickly. We don’t know why he died. He hadn’t been sick. There was no injury. He had been acting normal. The whole family is crushed. Wizard was greatly loved and will be deeply missed. How deeply distressing for you all. I am so sorry for your loss, Wizard was a beautiful boy. We are so sorry to hear about Wizard. We send you comforting purrs and lots of hugs. Oh, dear, we didn’t know your Wizard, but we know the pain of loss. Your daughter must be the hardest hit by his sudden passing. We send warm hugs, purrs and paw taps of comfort to Wizard’s loving family. Wizard was a beautiful soul and a member of your family. I don’t know what to say. Nothing is sufficient. I want to hug you till the pain goes away….this is impossible but what I feel would help. Some strange woman hugging you! Just what you need. My heart is with you. we are so very sorry….. I am so very sorry! 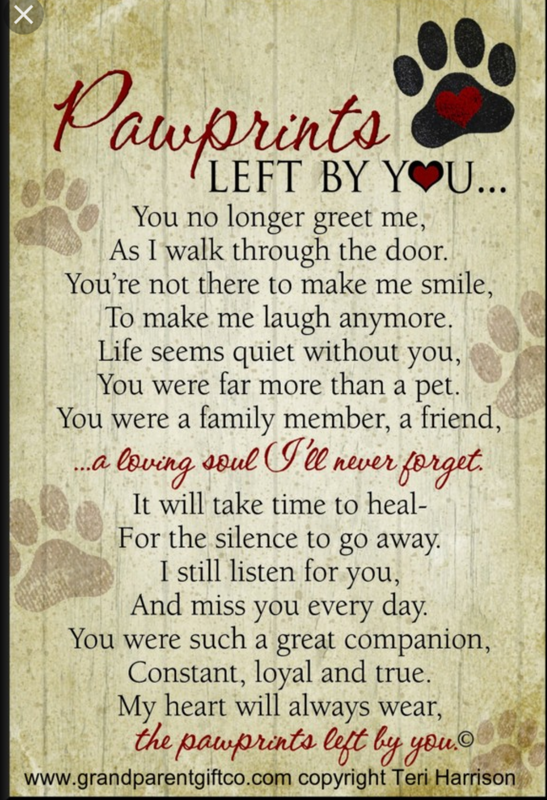 It is horrible to lose a fur baby. How unbelievably heartbreaking. It is never easy to lose someone you love, my heart goes out to you. Farewell to your beautiful boy, we are saddened he left you so quickly to cross his Rainbow Bridge … may he journey and rest be ever peaceful. So so sorry. We are so sorry that Wizard left you all but just know that he was a lucky boy to have had a home with all of you. We feel for the daughter too.. Take care..
What a sad a terrible shock for you all. I’m so sorry for your loss. That is terrible. I’m so sorry. so furry sorry to read this news. blessings an’ peace to you and yer fambly. We’re so sorry for your loss. Hugs and purrs to you. We are so very sorry. Our sweet Billy left for the Bridge yesterday as well – I’m sure they met there. 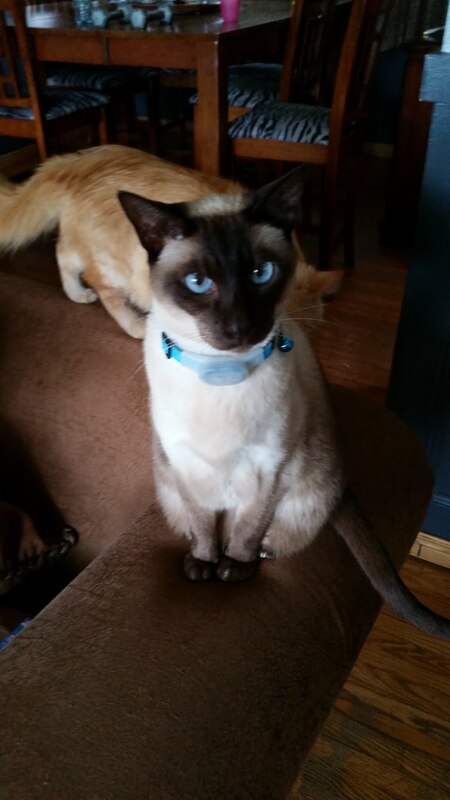 Wizard was a gorgeous meezer boy! Having gone through a sudden loss with my William in June I totally understand and empathize with your shock and sadness. I am so very sorry. I know nothing can ease your pain right now, but time will make it a little easier to bear in coming months. Hugs and warm thoughts to you and your family. So sad when it’s so sudden. I’ve had cats disappear and never return alive, and I’ve had cats decline before they passed, but to have them die suddenly at home is something I’ve never had happen. We are so very sorry for your traumatic loss of Wizard. It’s never easy to lose a loved one, but to lose one suddenly with no warning is very hard. Comforting purrs and paws of sympathy for you and your family at this sad time. So sorry to hear your sad news about Wizard. Especially hard when it is unexpected. Purrs to all of you. We are so sorry for your sudden loss of Wizard. 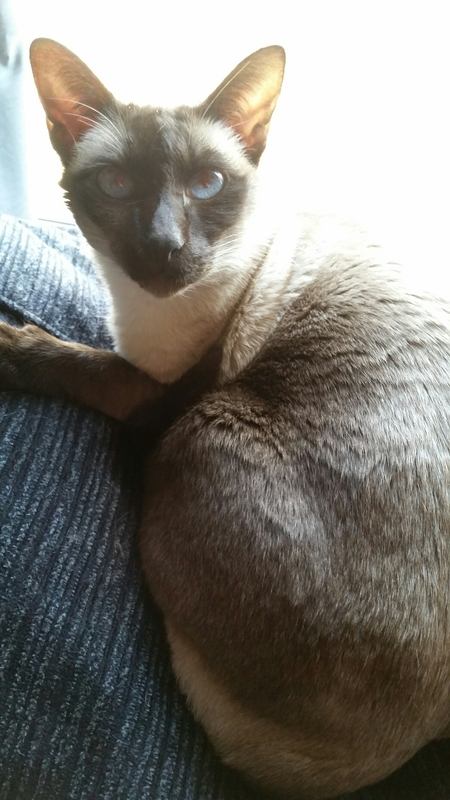 He was a beautiful Siamese. You have our deepest condolences. I am very sorry to have read of Wizard’s passing. Is it better that a loved one goes quickly without pain, or that we have a chance to appreciate him all the more knowing that he will soon go? Neither is good; both are loss. I wish I could write something comforting, but nothing comforts at such times. Godspeed, Wizard. So sorry to hear about Wizard, may he live on in your hearts. so sad to hear of Wizard passing away so quickly and without warning. I had that happen to one of my babies too. Soo hard when no reason is known. Purring fur your family and Wizard’s housemates… -Katie and The Katie Katz. We are so sorry Wizard was needed at the Bridge so quickly. Our hearts go out to you and we’re sending lots of purrs and hugs. We are very sorry to hear about Wizard. We was a very handsome cat. We understand the suddenness of his passing. Our Georgia’s brother Moxie died the same way after eating breakfast. We wish we could stop the hurt you all feel. We send comforting purrs and hugs. Thank you to everyone who offered kind thoughts. My family appreciates it. I am so sorry to read of the passing of Wizard. This probably doesn’t help, but often the case of instant death is a heart condition that is almost never diagnosed, where the veins are just closing in on themselves over time. Hypertrophic cardiomyopathy. No symptoms, no warning. So hard…I am very sorry. We are new here but feel like Wizard was family, as we feel about all the pets we have come to know online. His passing was a blow that will take you a while to recover from but know there are many hearts that have experienced the same thing and will share in your pain to lesson your burden. So very sorry to hear Wizard has passed so suddenly. Sending love and hugs. We’re so very sorry to hear about the handsome Wizard. May he be running through a field of catnip at the Bridge. I am catching up on posts and was desperately sorry to hear this. Having them pass suddenly is hard and heartbreaking. Wizard looks the most amazing cat I bet you loved him heaps.